Another question about color computers in the days of CRT televisions! ... they definitely do not look square; they look to me about as rectangular as the screen itself, maybe 4:3, which suggests horizontal resolution should be about the same as vertical resolution? The other thing that jumps out at me is that the columns of pixels are offset half a pixel height, which is the last thing I was expecting on a system that scans by horizontal lines. What's going on with that? Does the electron beam half-light two pixels every other pixel? Does it have anything to do with interlacing? CRT TVs are analog devices, there is no "pixel", but the size of the spot limits the resolution of the image, as the size of silver nitrate crystals limits the resolution of photo films. Several arrangements of the colour stripes on the CRT tubes have been designed, they are a compromise between resolution, luminosity and the precise alignment of the electron guns and shadow mask. Trinitron CRTs, with vertical stripes, made very good computer monitors. For interlaced analog TV signals, the pattern above with staggered pixels is probably better and more mechanically stable than a rectangular array. 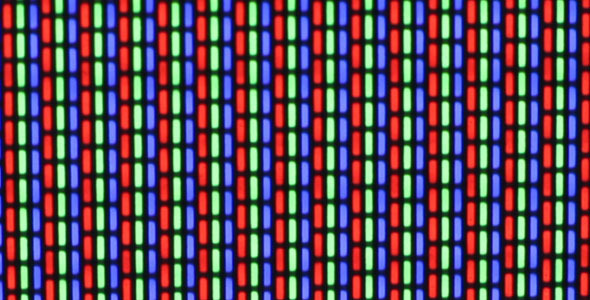 At the age of CRT displays, there was no exact alignment of pixels to the phosphors patterns, like it is common nowadays with LCD screens. The analog bandwidth and dispersion of electrons made every pixel a Gaussian circle. The coloured mask is overlaid over this circle, phosphors are unevenly lit. In a way, I did not answer the reason why a computer could not align the dots in memory to a precise coloured spot on a cathodic tube. It is because is it is an open-loop system! There is no feedback between the displayed image and all the electronic stuff between the very low voltage VGA signals and the very high voltages driving the CRT. A CRT is mechanically stable, and the manufacturers painfully optimized the construction for a precise alignment of phosphors to the shadow masks and electron guns, with thick hardened glass and temperature stable alloys. So the "blue" gun only lights blue phosphors. There is not such precision for the electronic part. Even minimal variations of the temperature and the wear of components can slightly change the electron acceleration voltage and the voltage put into deviation coils. Even Earth magnetic field or a nearby loudspeaker (and there are loudspeakers in TVs and many computer displays !) can move the position where electrons fall. Without a very complex and precise regulation mechanism, sensors in the CRT able to measure electric charges or where light is emitted, there is no way to align pixels to phosphors. And here, after this long digresssion we wander back to paleo-computosaurs. Williams-Kilburn CRTs (https://en.wikipedia.org/wiki/Williams_tube) were used as computer memory, measuring the electric charge of each pixel. Even the wikipedia article mentions the issues with having to constantly recalibrate the fixture. Here, the pixels on the CRT and the video RAM are actually the same thing! Too bad the hardware for probing pixels is hiding them ! Besides TEMLIB's excellent answer relating to the physical characteristics of the TV, it's also worth pointing out the effects of the video input itself as well. For analogue video input, the picture is encoded as a continuously varying value, in the form of a wave. The higher the horizontal resolution you want, the more detailed the variations in this value need to be, so the higher bandwidth you need to use, for various mathematical reasons. So the horizontal resolution is based on the chosen bandwidth - since there's only so much useful electromagnetic spectrum, this of course is a compromise. But for vertical resolution, the story is different. An analogue TV signal is encoded with a specified number of lines (there are generally only a small number of choices that a TV will support; but a CRT designed as a computer monitor might well support more), with a special signal at the start of each line so the TV knows to switch the beam off and move it back to the start of the next line. This is further complicated by some of these scanlines being invisible, due to them being in parts of the screen where the distortion from the convex CRT would be too great, or due to the TV needing time to move the beam back to the top left to start the next frame. But besides these issues, the vertical resolution is well-defined, whereas the horizontal resolution is not. Of course, if you connect a digital computer to an analogue TV, there will certainly be a defined resolution at the stage when the digital picture is converted into an analogue signal for output. And many old computers do indeed use pixels that end up being rectangular when displayed on the screen. Not the answer you're looking for? Browse other questions tagged display color-display crt-monitor screen or ask your own question.